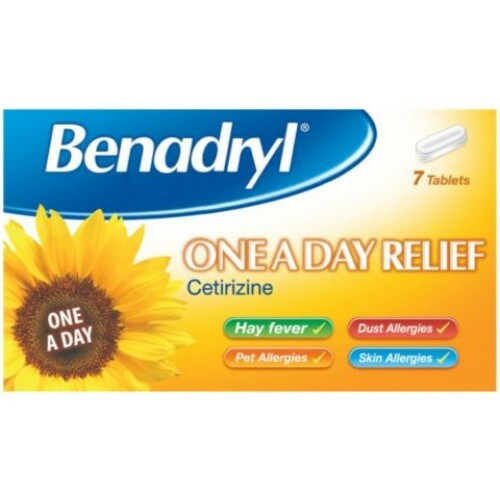 Benadryl One A Day Allergy Tablets - Once daily relief from hayfever and year-round allergy symptoms such as dust and pet allergies. It can relieve symptons such as runny nose, sneezing and watery or itchy eyes. It can also relieve urticaria (hives or itchy skin rash). Each tablet should be swallowed whole with a glass of water. If symptons persist consult your doctor. If you have taken more tablets than you should, talk to your doctor or pharmacist immediately or go to your nearest accident & emergency (casualty) department as soon as possible. Take as soon as you remember but wait at least 24 hours before taking your next tablet. Do not take a double dose to make up for forgotton individual doses. Do not take this medicine if you have ever had a bad reaction to any of the ingredients in this product, or any other antihistamine. As with all antihistamines, it is advisable to avoid excessive alcohol consumption when taking your tablets. If you have kidney problems, speak to your doctor or pharmacist before using this product. Tell your doctor or pharmacist if you notice any of the following: headache, dizziness, drowsiness, agitation, dry mouth, upset stomach or fits. If you notice any side-effects not mentioned, please tell your doctor or pharmacist. Always read the product information leaflet before using this product. Microcrystalline cellulose, lactose, colloidal anhydrous silica and magnesium stearate.